The advanced Anatomy Laboratory for Research, Education, and Clinical Skills was established in 2008 with the goal of improving patient care by providing health care professionals with an environment to review and explore anatomy pertinent to their particular discipline. These advance anatomical studies allow heath care professionals to practice clinical skills on human donors in a relaxed, low risk setting before interacting with a live patient. Health care providers using the laboratory are encouraged to question, explore and think creatively about how they approach a task. 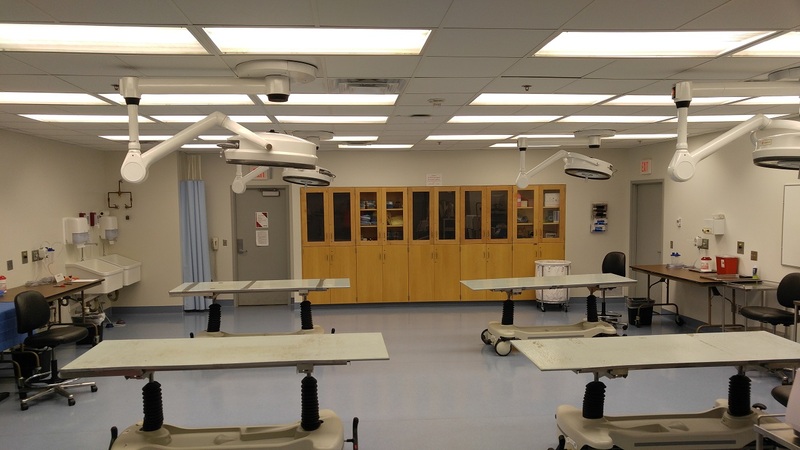 The lab has four surgical stations each equipped with a radiolucent surgical table, a single head Polaris surgical light, suction, 65 psi compressed air port, four 120-volt electrical outlets and one 220-volt electrical outlet. The 33’x27’ laboratory is located in room 2018 Wittson Hall, and is managed by the Department of Genetics, Cell Biology and Anatomy at the University of Nebraska Medical Center. Please direct lab inquiries to Jesse Boyd at 402-559-6109.